Myzostomid with the newly described crinoid shrimp standing over it. 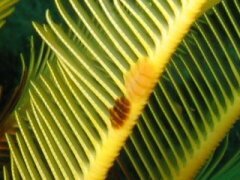 Georgina Jones and Sharon Albert, on finding the crinoid shrimp, Hippolyte catagrapha, also found these odd "bumps" on the elegant feather stars (crinoids), Tropiometra carinata They approached Professor Charles Griffiths from the zoology department at UCT, for help. He was very interested - to quote from his e-mail: "myzostomids are an odd group of animals previously thought to be polychaetes but now thought to be a phylum on their own. They have 5 pairs of soft legs and steal food from the feeding grooves of crinoids and basket stars. I have lined up a taxonomist in Europe to identify them. I am keen first to look in the other crinoid species (the common feather star Comanthus wahlbergi) to see if this has myzostomids as well. It will also be interesting to check the basket star (they are found in the stomach of other related species to ours)." 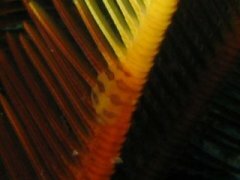 A genetic study performed in Belgium has shown that myzostomids are indeed not related to polychaetes, but are more closely related to flatworms (Platyhelminthes). The myzostomid is a new, undescribed species, of the genus Hypomyzostoma. It is currently being described. This is what the Belgian researches helping with the description had to say: "Our analyses indicate that the Hypomyzostoma from South Africa is certainly a new species. 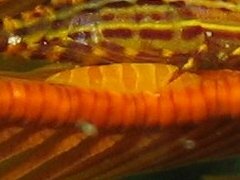 First, there are five transversal bands on the adults that is unusual on the known hypomyzostomes (they have generally more than ten). Second there is a difference of at least 2% between the 18S rDNA sequence of this myzostome and each of the seven compared hypomyzostomes." Lanterbecq, D, Hempson, T.N., Griffiths, C.L.& Eeckhaut, I. In press. Myzostoma fuscomaculatum (Myzostomida), a new species of myzostomidan from False Bay, South Africa. Hydrobiologia.